2 This bird has been appearing in my garden from time to time. Always alone. Last time but one, it was foraging for grass and straw. That was late May. I woke early yesterday morning and found it having a bath in my garden in the water dish at 6 in the morning. I live on the ourskirts of a small town in Northern Ireland, where there are a lot of fields and trees nearby. Sorry the pictures are a bit blurry as I was holding the camera with a long lens - hadn't time to set up my kitchen window tripod. 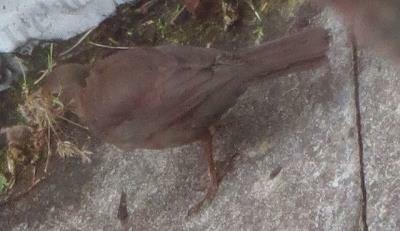 44 This looks like a female Blackbird, Ziggy. The females are brown with a dark yellowish beak unlike the males that are black with a bright yellow beak and yellow eye-ring. Both males and female blackbirds tend to forage alone. 2 Thanks Mick, never saw one of these before. 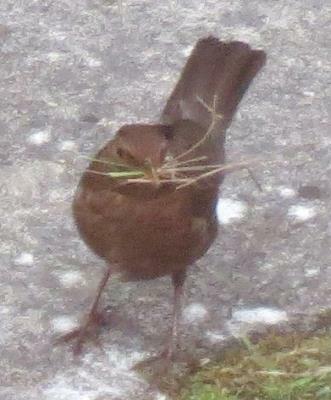 Is the male blackbird (who I see all the time) - more outgoing? 44 Sorry for the delay in responding, Ziggy but I have been away. Yes, the male Blackbirds are very outgoing and the resident male in our garden will approach me for food as I put scraps on the bird table. The females, however, will fly off as soon as the back for is opened. The females are not over-shy though and happily feed from the bird table or root in the lawn when they think the coast is clear. In the autumn, when the apples on our tree are very ripe we cut a few in half each day and leave them on the lawn and the female blackbirds love them, clearing them daily.